Meghan and Justin are city-folk but looove the Muskoka life. After meeting them for their winter engagement session at Arrowhead Provincial Park earlier in the year – their day had finally arrived. 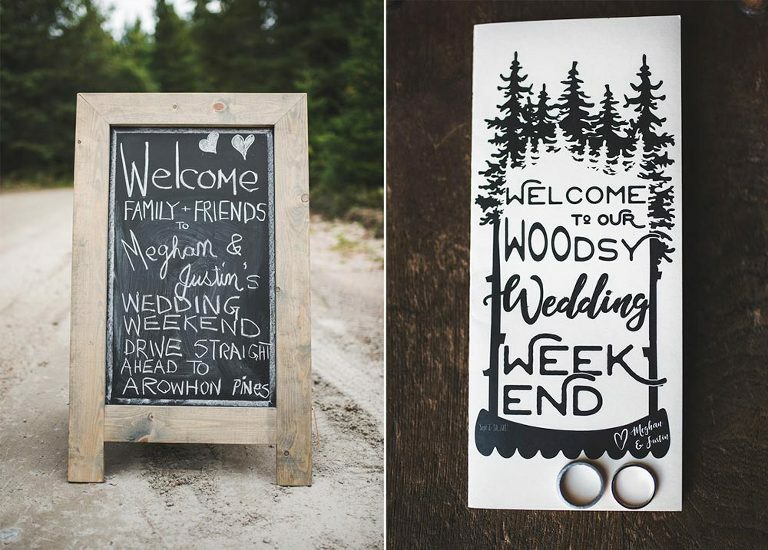 Arowhon Pines Resort in Algonquin Park is one of my favourite wedding venues has all of Muskoka’s goodness wrapped up in one beautifully rustic package. A camp-style main lodge with cottages spread throughout the woods all with a view of the lake. 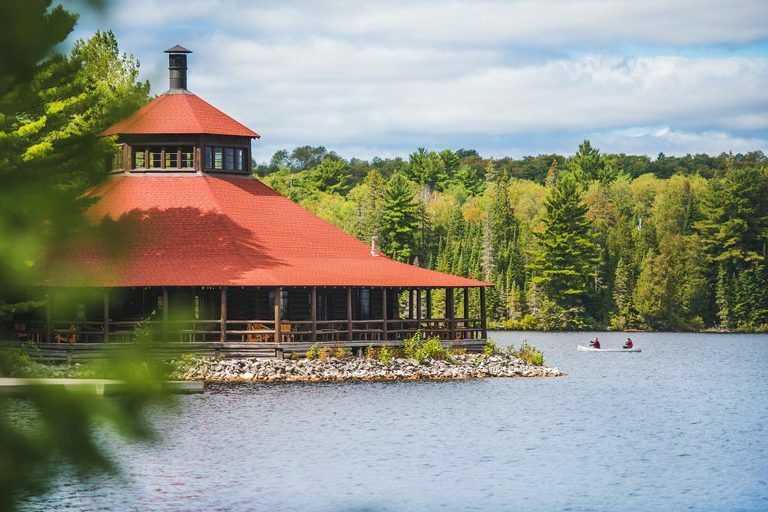 It’s a remote area several kms off the main Algonquin highway – which is exactly what you’d be looking for if you found yourself this deep in this massive Provincial Park. 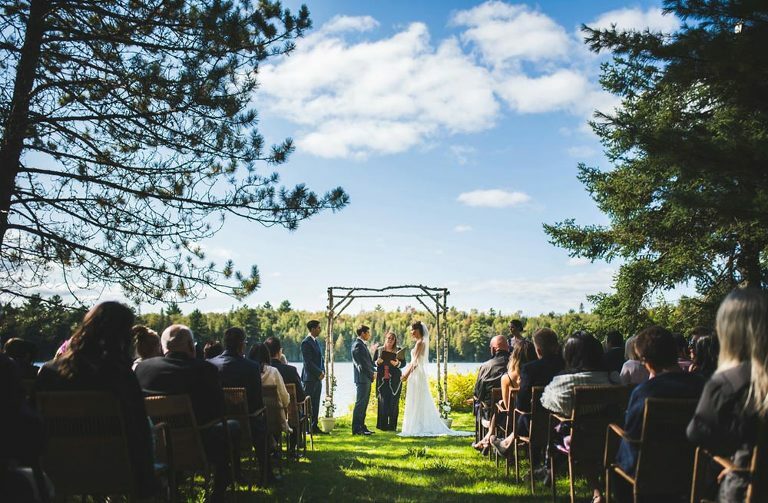 My favourite feature for weddings here is that your friends and family can stay right here with you for the weekend …you get a cottage, and YOU get a cottage! You can get together and visit over breakfast or a bonfire – spending quality time with those closest to you. Bonus idea: Justin was all about the boat races Sunday morning after the wedding – something to consider! I can always ask him for his boat race best practices and itinerary if you’re interested. A big shout-out to Lucy Myers Events for bringing everything together at Arowhon! And I’m telling ya, the food at Arowhon? Wow… incredible! If you’re considering Algonquin locations, do yourself a favour and make the drive for a tour and stay for dinner! Tell them Vaughn sent you, not that it will make any impression on them whatsoever, but it sounds cool. WHAT DID THEY LOVE MOST ABOUT THEIR AROWHON PINES WEDDING? Meghan: I really enjoyed the quiet moments I spent with my mum, as we took some mother-daughter photographs, and the time spent with my dad, when it was just the two of us preparing to walk down the aisle. Being able to spend so much quality time with my parents and brother kept me grounded and was so important to me. During the ceremony, it felt so great to be in that moment, marrying my longtime love. It was also really lovely to look out at all our favourite people, supporting us at such a special time in our lives. Listening to the speeches by our siblings, cousins, parents and closest friends was also an incredible experience. It is so amazing when people share such a strong love for and connection with you. Finally, I loved both my first dances (thank you, Dad and Justin)! Justin: I was honestly overwhelmed by the outpouring of love, affection and support from our friends and family. It felt like such a singular opportunity having all of the most important people in your life gathered in one place – people with whom you’ve had so many common experiences, gone on so many adventures and shared in so much sorrow and joy. Walking into the dining hall and feeling like my entire world was in the room with me made me both nostalgic and hopeful all at once. I will not forget my first dance with Meghan, throughout the entire song (which flew by in a flash) I just wished I could stop time to continue to cherish the moment. Meghan: Justin (my new husband!!) is such a supportive force in my life. Over the past year, he has worked so hard to make sure the weekend was everything I dreamed of (and more). I am thrilled that he was able to enjoy both the wedding and his beloved canoe race the following day! Justin is my true love, today and always, and I am so excited to share our lives with one another. Justin: Meghan never ceases to surprise me with her capability to bring people together and be genuinely overjoyed with life’s little things. Her smile is infectious and it’s easy to get caught up in her happiness. Try on your wedding dress in the weeks leading up to your wedding (!! ), hire a wedding coordinator, consider a first look with your spouse-to-be (it was a very special time for just the two of us, and I will never forget the happy look on Justin’s face), invest in photography (!! ), and take moments throughout the wedding day to really let each emotion sink in … the day goes by very quickly! Don’t get too caught up in individual details. You spend so much time planning little pieces of the wedding. You’re probably going to be the only one who notices that something isn’t as perfect as you might wish on the actual day – life happens, laugh it off and don’t let it distract you from being able to take in this once-in-a-lifetime event. WHAT MADE THEM CHOOSE AROWHON PINES AS THEIR WEDDING VENUE? We have spent a few camping trips in Algonquin together, and for Meghan, the park has become her ‘happy place’ in Ontario. We fell in love with Arowhon Pines during an overnight stay, in advance of a camping trip in early summer of 2016. One of our biggest priorities for our venue selection was to be able to host a weekend wedding event, so that our friends and families could come together for a big reunion. The staff, chef David Cooke, and Theresa & Adam embraced and supported us as family from our first meeting. The off-the-grid, serene location in the woods was the perfect fit for our personalities and our dream wedding.